Have you fallen in love with Reykjavík? Iceland’s capital seems to be on everyone’s must-visit list this year. The country has seen a huge tourism increase since the financial crisis devastated its economy a few years ago. People go to soak in the Blue Lagoon, tour the Golden Circle—Þingvellir National Park, Gullfoss waterfall, and Geysir—and party in the world’s northernmost capital. But few people venture beyond the southwestern corner of the country. It’s time to change that. You don’t have to drive very far outside of Reykjavík to start feeling like you’re in the middle of nowhere. Follow Route 1, the Ring Road that circles the entire country, north. After passing through Hvalfjörður Tunnel, the houses start to spread out. On your left: the sparkling turquoise water of Faxa Bay. On your right: whale fjords, glaciers, and lots of sheep. You’ll leave the Ring Road when you reach Borgarbyggð, a good place to stop for gas and necessities. It’s only going to get more desolate from here. The Ring Road continues north, but you’re veering northwest, toward the Snæfellsnes. The peninsula is home to Snæfellsjökull. 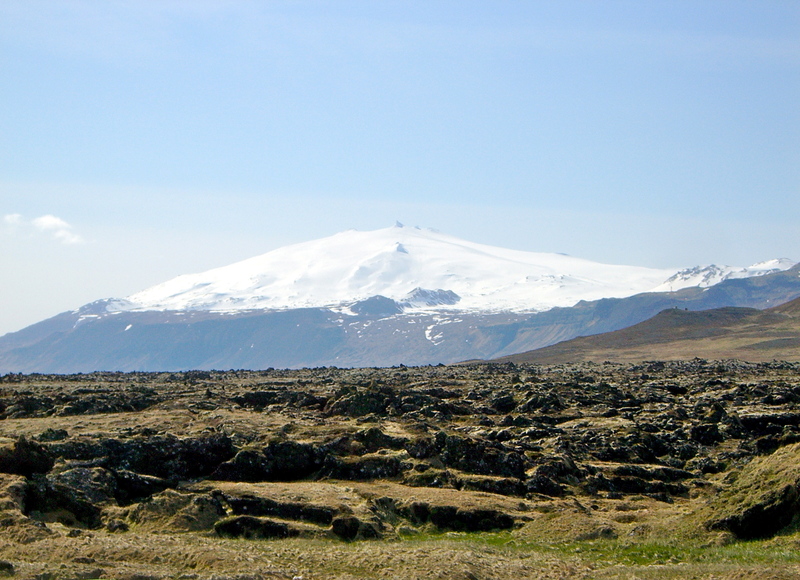 The dormant, glacier-covered volcano, which can be seen from Reykjavík on a clear day, was the setting of Jules Verne’s Journey to the Center of the Earth. It’s surrounded by lava fields, waterfalls, black-sand beaches, and the endless North Atlantic Ocean. Some say elves live here; others say no one does. So you’ll be a bit surprised when you reach Búðir. Once a trading center, the area can barely be called a village now. It’s where the Hraunhafnará waterfall flows from the glacier. The ground is dotted with moss-covered volcanic rocks. 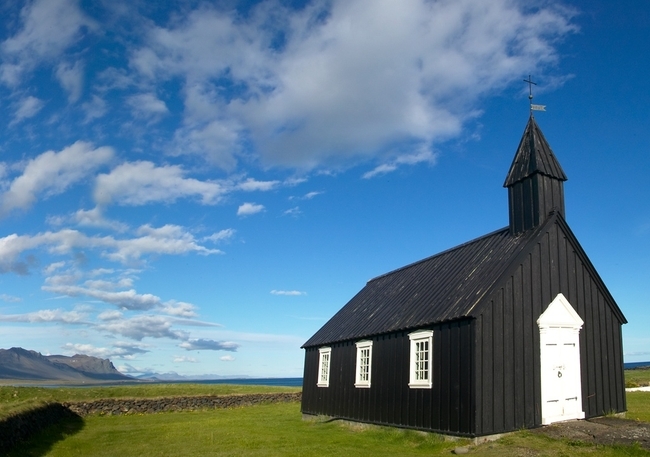 And a black, 19th-century church overlooks a golden-sand beach, rock pools, and an upscale hotel. That’s right. There’s an upscale hotel in the middle of nowhere. Hotel Budir was built as a guesthouse in the 1940s, a fire destroyed the original building in 2001, and it has since been rebuilt into one of Iceland’s finest destination hotels. Every room has a view, whether it’s of the glacier or the water. The bar offers rare whiskeys and a brass telescope for stargazing. And the restaurant is considered “the mecca of Icelandic cooking” with its local, seasonal cuisine that features lamb and seafood. Spend the day touring the glacier on a snowmobile. You’ll never forget the view from the top. Visit Djúpalónssandur beach to see frozen lava formations, the ruins of a shipwreck, and a lonely lighthouse. Don a headlamp and climb down into the Vatnshellir lava cave. Stop at Hotel Hellissandur for a quick meal. The chef will fry freshly caught fish even if it’s past lunchtime. Bundle up and go whale watching. You’ll see seals and puffins before minke or killer whales. Or go horseback riding on a famous Icelandic horse that’s the size of a pony. You see so many cool places and do so many different things during your few days in the Snæfellsnes that you start to wonder what else Iceland is hiding. You may just have to take the Ring Road in the opposite direction to find out.